Asteroid 4179 Toutatis (formerly 1989 AC) was discovered by C. Pollas on January 4, 1989, at Caussols, France, on photographic plates taken on the 0.9-m Schmidt telescope by Alain Maury and Derral Mulholland during astrometric observations of Jupiter's faint satellites. Toutatis is the long streak in this image. Toutatis's eccentric, four-year orbit, illustrated here by JPL's Near-Earth Object Program Office, extends from just inside the Earth's orbit to the main asteroid belt between Mars and Jupiter. The plane of Toutatis's orbit is closer to the plane of the Earth's orbit than any other known several-kilometer Earth-orbit-crossing asteroid, or ECA. It is in a 3:1 mean-motion resonance with Jupiter that serves as a dynamical pathway from main-belt orbits to Earth-crossing orbits on time scales of a million years. Toutatis may have the most chaotic orbit studied to date, a consequence of the asteroid's frequent close approaches to Earth. The following table of Toutatis close approaches is based on information available from the JPL Horizons Ephemeris System. The Sep. 29, 2004, approach is the closest in this century of any known asteroid at least as large as Toutatis (or more precisely, of any known asteroid with an absolute magnitude as small as H = 15.30). Click here for close-approach tables. Delay-Doppler radar imaging during Toutatis's Dec. 1992 close approach (to within 0.024 AU, or 9.4 lunar distances) provided information that was unprecedented for an Earth-crossing object (Ostro et al. 1995). Hudson and Ostro (1995, hereafter HO95) used a comprehensive physical model to invert the lower-resolution images to estimate the asteroid's detailed shape and inertia tensor, initial conditions for the asteroid's spin and orientation, the radar scattering properties of the surface, and the delay-Doppler trajectory of the center of mass. They found that Toutatis is rotating in a non-principal-axis "long-axis" mode characterized by periods of 5.4 days (rotation about the long axis) and 7.4 days (average for long-axis precession about the angular momentum vector). The asteroid's maximum extents along the principal axes are (1.92, 2.29, 4.60) +/- 0.10 km. The dynamically equivalent, equal volume ellipsoid (DEEVE), that is, the ellipsoid that has the same moment ratios and the same volume as the asteroid, has dimensions (1.70,2.03,4.26) +/- 0.08 km. The inertia tensor is indistinguishable from that of a homogeneous body. Using the low-resolution shape model, Hudson and Ostro (1998) analyzed optical lightcurves (Spencer et al. 1995) and produced estimates of the object's Hapke parameters and a slight refinement of the spin state. That model also was used by Scheeres et al. (1998) to examine the dynamics of orbits very close to Toutatis and by Scheeres et al. (2000) to explore the possible role of gravitational interactions in the origin of Toutatis' spin state. Observations of Toutatis during its 1996 approach to within 0.035 AU (Ostro et al. 1999) produced nine consecutive days of delay-Doppler and Doppler-only measurements, increasing the radar time base from three weeks to four years and thereby permitting significant refinements in our knowledge of the asteroid's orbit, spin state, shape, and radar scattering properties. This experiment, which confirmed the accuracy of predictions of the progression of Toutatis' delay-Doppler signature (Hudson and Ostro 1996) refined estimates of the asteroid's orbit, spin state, and surface properties. Those properties are strikingly uniform, provide evidence for a smooth surface component, and are consistent with Toutatis' surface having a smooth component that is at least one-third covered by rocks at least as large as the wavelength. If this S-class object is mineralogically similar to stony-iron meteorites, then the smooth surface component probably is regolith whose porosity resembles that of lunar soil. If the mineralogy is ordinary chondritic, then the smooth surface component is probably solid with not much more than a centimeter of overlying regolith. Images with delay resolution of 125 ns (range resolution of 19 m) were obtained on eight dates in 1992 and on nine dates in 1996. Hudson, Ostro and Scheeres (2003) presented a shape model that incorporates those 17 images as well as lower-delay-resolution (typically 500-ns) images from the 10 dates in 1992 on which no 125-ns images were obtained. The high-resolution model's intrinsic areal resolution, (~34 m)^2, is significantly finer than the HO95 model's areal resolution (~84 m)^2, and is comparable to those of Galileo's highest-resolution images of Dactyl and NEAR Shoemaker's first images of Eros after orbit insertion. An animation that shows the high-resolution model of Toutatis rotating is available as an avi file, or as a stereo avi file. Note: due to a drive crash, the latter file is not currently available. If/when we locate it, we'll add it back to this website. When Toutatis was discovered, its December 1992 approach was eagerly anticipated as an unprecedented opportunity for radar investigation of a small body. The southerly declinations near closest approach made conditions more favorable for the fully steerable Goldstone radar in California than for the more sensitive Arecibo radar in Puerto Rico. Images placing hundreds to thousands of resolution cells on Toutatis were obtained at Goldstone daily during Dec. 2-18 and at Arecibo daily during Dec. 14-19. Radar images, which are geometrically very different from normal optical pictures, cut up the echoes in time delay (range) and Doppler frequency (line-of-sight velocity). This collage shows Goldstone low-resolution images from 2-18 December (top three rows) and Arecibo images from 14-19 December (bottom row), plotted with time delay increasing toward the bottom and Doppler frequency increasing toward the left. On the vertical sides, ticks are 2 microseconds apart. Two horizontal sides have ticks separated by 1 Hz for Goldstone and 0.28 Hz for Arecibo; those intervals correspond to a radial velocity difference of 18 mm/s. From Ostro et al., Science 270:80-83, 1995 (© Copyright 1995 by the AAAS). The images revealed Toutatis to be a several-kilometer-long object with a nonconvex shape dominated by two components in contact, one approximately twice as large as the other. The highest-resolution images, show craters with diameters ranging from about 100 m to about 600 m. The high-resolution Goldstone image at the right was obtained on Dec. 8, at the asteroid's closest approach. From Ostro et al., Science 270:80-83, 1995 (© Copyright 1995 by the AAAS). Analysis of the delay-Doppler imaging sequence established that Toutatis is in a non-principal-axis spin state with characteristic time scales on the order of several days, but accurate determination of the asteroid's rotation required inversion of the image sequence with a realistic physical model. Techniques developed by Scott Hudson (Washington State Univ.) 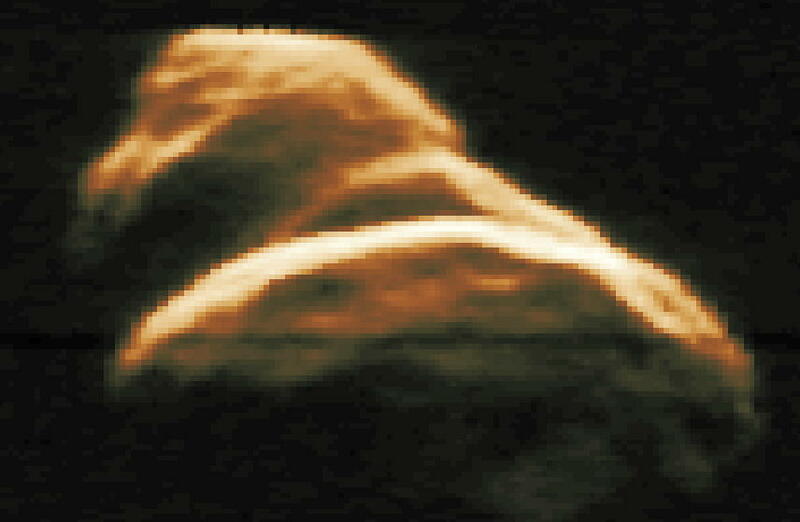 were used to carry out such an inversion on the low-resolution Goldstone images and the Dec. 19 Arecibo image. The inversion solved for the asteroid's shape and inertia tensor, their orientation with respect to each other, initial conditions for the asteroid's spin and orientation, the radar scattering properties of the surface, and the projected location of the asteroid's center of mass in each frame. The outcome of the Hudson inversion is the most detailed physical model of any Earth-crossing asteroid. For example, we know that either Toutatis's density is homogeneous or its inhomogeneities mimic the inertia tensor of a homogeneous body. (See Hudson's Toutatis web site and the paper by Hudson and Ostro, Science 270:84-86, 1995 (© Copyright 1995 by the AAAS)). These four views of the Toutatis computer model show shallow craters, linear ridges and a deep topographic "neck" whose geologic origin is not known. It may have been sculpted by impacts into a single, coherent body, or this asteroid might actually consist of two separate objects that came together in a gentle collision. Toutatis is about 4.6 kilometers (3 miles) long and the resolution of the computer model is about 84 meters. 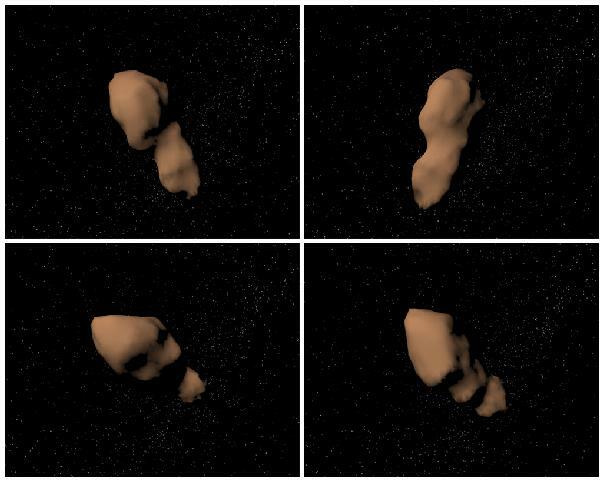 Toutatis has one of the strangest rotation states yet observed in the solar system. Instead of the spinning about a single axis as do the planets and the vast majority of asteroids, it "tumbles" somewhat like a football after a botched pass. Its rotation is the result of two different types of motion with periods of 5.4 and 7.3 Earth days that combine in such way that Toutatis's orientation with respect to the solar system never repeats. To experience a simulated landing on Toutatis and a view of the vortex-like appearance of the sky from Toutatis, click here (8-MB mov) or here (2-MB mov). The accuracy of the Toutatis computer model has been demonstrated by the fine match between its prediction for the form of optical lightcurves and actual data obtained in 1992; see this animation (larger file, higher quality) or this animation (smaller file, lower quality). The asteroid's 1996 approach was not as close as in 1992, and Arecibo was unavailable (that telescope was being upgraded), but Goldstone was used for high-resolution imaging on nine straight dates. Toutatis's delay-Doppler signature was qualitatively as expected from predictions based on the existing computer model. Images like the ones below have been used to refine the spin-state parameters and to produce a high-resolution shape model; see the first two entries in the list of references below. Goldstone images of Toutatis from Nov. 29, Dec. 1 and Dec. 2, 1996. The animated and still (single frame) visualizations of the Toutatis model on this page were done by Eric DeJong and Shigeru Suzuki at JPL's Digital Image Animation Lab (DIAL). The Yarkovsky effect is a very subtle, nongravitational phenomenon involving acceleration of a rotating object due to its anisotropic thermal emission of absorbed sunlight. We plan S-band delay-Doppler imaging of 4179 Toutatis in October 2004, shortly after this 2.5-km near-Earth asteroid's Sep.29 approach to 0.010 AU of Earth. Our objective is accurate radar ranging, which we expect to reveal Toutatis' Yarkovsky acceleration, whose strength is a function of the asteroid's mass and surface thermal characteristics. We expect to obtain a useful mass constraint from our ranging, as we did with Golevka (Chesley et al. 2003, Science 302, 1739-1742). Radar imaging of Toutatis during close approaches since 1992 and reconstruction of the object's shape and spin state have been comprehensive, producing a model accurate to a few decameters. Thus the asteroid's volume is well known, and our experiment should provide an estimate of the asteroid's density. High-Resolution Model of Asteroid 4179 Toutatis. A model of the shape of Toutatis based on "high-resolution" radar images obtained in 1992 and 1996 consists of 39,996 triangular facets of roughly equal area, defined by the locations of 20,000 vertices. These define the average spatial resolution of the model as approximately 34 m, significantly finer than Hudson and Ostro's (1995, Science 270, 84-86) model (1600 vertices, resolution 84 m). The high-resolution model reveals complex linear features as well as circular crater-like structures down to the resolution limit. There is a dichotomy between the gravitational slope distributions on the asteroid's two lobes. The noncraterlike features may be the manifestation of complex interior configurations involving monolithic fragments with various sizes and shapes, presumably due to collisions in various energy regimes. However, it may be impossible to decipher the interior structure and responsible collisional history of Toutatis and other small objects without extended, intensive, direct examination. The Diagnosis of Complex Rotation in the Lightcurve of 4179 Toutatis and Potential Applications to Other Asteroids and Bare Cometary Nuclei. Mueller, B. E. A., N. H. Samarasinha and M. J. S. Belton, Icarus 158, 305-311 (2002). We report initial results of daily delay/Doppler observations of Toutatis with the Goldstone 8510-MHz (3.5-cm) radar during Nov. 25-Dec. 3, 1996. Using the physical model of Toutatis derived from 1992 radar observations (Hudson and Ostro 1995, Science 270, 84-86) to analyze the new data, we obtain refined estimates of the asteroid's orbit, spin state, and surface properties. The asteroid's centimeter-to-decameter surface characteristics are strikingly uniform. The disc-integrated circular polarization (SC/OC) ratio mu_C averages 0.29+/-0.01 and is independent of rotational orientation at the several percent level. Dual-polarization images reveal a slight drop in mu_C at echo leading edges, which we interpret as the signature of a smooth surface component. The OC radar albedo averages 0.24+/-0.03 it depends on rotational orientation, as expected from the asteroid's angular scattering behavior (limb-darkening slightly more than Lambertian). The OC albedo of a sphere with Toutatis' radar properties would be 0.21, or three times the lunar value. The radar properties and available nonradar constraints are consistent with Toutatis' surface having a smooth component that is at least 1/3 covered by rocks at least as large as the wavelength. If this S-class asteroid is mineralogically similar to stony-iron meteorites, then the smooth surface component probably is regolith whose porosity resembles that of lunar soil. If the mineralogy is ordinary chondritic, then the smooth surface component is probably solid with not much more than a centimeter of overlying regolith. We report delay-Doppler astrometry referenced to the asteroid's center of mass (COM) for each day of our experiment. An orbit solution that incorporates those measurements as well as the radar astrometry reported by Ostro et al. (1995, Science 270, 80-83) and 588 optical astrometric observations from 1988 through March 1997 has weighted rms residuals of 0.98 arcs, 0.10 Hz (1.8 mm s^-1 in radial velocity), and 0.49 mus in time delay (73 m in range). Integration of that orbit into the past and future shows that Toutatis' pattern of close approaches to Venus, Earth, and Mars is highly asymmetric about the current epoch. The probability of the orbit intersecting Earth is zero for at least the next six centuries. Toutatis will make its closest planetary approach since at least 1353 and until at least 2562 on Sep. 29, 2004, when the closest COM-to-COM separation of Earth and Toutatis will be 1,549,834+/-10 km (4.0 lunar distances). We use refined spin-state parameters and the 1995 shape model to generate ``movies'' that predict the asteroid's rotational motion during its 2004 close approach, in geocentric and inertial frames. Relation between rotation and lightcurve of 4179 Toutatis. Kryszczynska, A., T. Kwiatkowski, S. Breiter and T. Michalowski. Astron. Astroph 345, 643-645 (1999). Dynamics of orbits close to asteroid 4179 Toutatis. Photometric properties of asteroid 4179 Toutatis from lightcurves and a radar-derived physical model. Hudson, R. S., and S. J. Ostro. Icarus 135, 451-457 (1998). Asteroid lightcurve observations near stationary points: (4179) Toutatis in 1997 February. Nakamura, T., T. Fuse. Publ. Astron. Soc. Japan 50, 531-536 (1998). Motion of the minor planet 4179 Toutatis: Can We Predict Its Collision with the Earth? Sitarski, G. Acta Astronomica 48, 547-561, (1998). Polarimetric Observations of 4179 Toutatis in 1992/1993. Mukai, T., T. Iwata, S. Kikuchi, R. Hirata, M. Matsumura, Y. Nakamura, S.-Y. Narusawa, A. Okazaki,M. Seki and K. Hayashi. Icarus 127, Issue 2, pp. 452-460 (1997). Radar images of asteroid 4179 Toutatis. Ostro, S. J., R. S. Hudson, R. F. Jurgens, K. D. Rosema, R. Winkler, D. Howard, R. Rose, M. A. Slade, D. K. Yeomans, D. B. Campbell, P. Perillat, J. F. Chandler, and I. I. Shapiro. Science 270, 80-84 (1995). Shape and non-principal axis spin state of asteroid 4179 Toutatis. Hudson, R. S., and S. J. Ostro. Science 270, 84-86 (1995). Imaging of asteroid 4179 Toutatis with the Hubble Space Telescope. Noll, K. S., H. A. Weaver, A. D. Storrs and B. Zellner. Icarus 113, 353-359 (1995). Spencer, J. R. and 47 colleagues Icarus 117, 71-89 (1995). UBVRI-Polarimetry of asteroid 4179 Toutatis. Lupishko, D. F., S. V. Vasilyev, Ju. S. Efimov and N. M. Shakhofskoj. Icarus 113, 200-205 (1995). Howell, E. S., D. T. britt, J. F. Bell, R. P. Binzel and L. A. Lebofsky. Icarus 111, 468-474 (1994). CCD reflectance spectra of Apollo asteroid 4179 Toutatis. Lazzarin, M., C. Barbieri, and F. Marzari. Planet. Space Sci. 42, 327-336 (1994). Radar investigation of asteroid 4179 Toutatis with 6 cm waves. Zaitsev, A. L., A. G. Sokolsky, O. R. Rzhiga, A. S. Vyshlov, A. P. Krivtsov, and V. A. Shubin. W Radiotekhnika Elektronika 38, 1842-1850 (1994) (in Russian). Translation: Radar investigations of the asteroid 4179 Tautatis at wavelength of 6 cm. Zaytsev, A. L., A. G. Sokol'skiy, O. R. Rzhiga, A. S. Vyshlov, A. P. Krivtsov, and V. A. Shubin. J. Comm. Tech. Electronics 38:16,135-143 (in English, by Scripta Technica, Inc., 1994). Visible and near-infrared spectral observations of 4179 Toutatis. Lazzarin, M. C. Barbieri and F. Marzari. Planet. Space Sci. 42, 327-336 (1994). The orbit determination of (4179) Toutatis from optical and radar data . Krivova, N. V., E. I. Yagudina and V. A. Shor. Planet. Space Sci. 42, 741-745 (1994). Long-term dynamical evolution of the minor planet (4179) Toutatis. Whipple, A. L., and P. J. Shelus. Icarus 105, 408-419 (1993).